Load your shotguns and get ready to blast your enemies because today, I’m going to showcase a project related to game development by Muhammad Saad, a BSCS graduate from Iqra University. A computer game enthusiast, he decided to do something he loved and at the same time rather unique for his final project, a game level for the massively popular Quake 3. It took 10-11 months of hard work, and the result reflects that. Interesting thing about the project is that the whole level is based on Saad’s university campus. So students of Iqra University, Islamabad Campus, will feel right at home playing this level. Multiple tools were used in this project, here’s a quick rundown for the people interested in knowing exactly what goes in to produce a game level. Saad was able to impress the animation house “Xdynamix” with his game level project, and was offered a job. Currently, his work responsibilities include Lighting, Texture and Rendering. This just goes to show the potential of our youth. Every other day we see projects and work done that reflects the intellectual level that our students are at. There’s a string need for initiatives to keep these talented individuals in Pakistan and not export them to other countries, where they may go seeking greener pastures. There’s no doubt that we’re a supremely talented nation, what’s needed is the nurturing of that talent so that we can compete and excel at the international stage. Amazing Innovation! I never knew that Islamabad Campus student are also enough capable MASHALLAH! to innovate something like that! very misleading article of this post. Good steps for pak students ;p go technology! Sad tghat he had to use probably pirated software for this conversion. Shows how far free software still has to go. He doesnt have to use any pirated stuff as the map creation softwares for these games are freeware and are readily available on the internet…..
3Ds Max 2010 isn’t for map creation, it’s for models. And, not free. Really, I don’t have a problem with what he has created. It’s a great thing. One of my friends tried to create a map for my university back in 1996 when Quake 1 was out, but he gave up due to lack of time (he was a fulltime staff employee). It’s a lot of work. I just wish more free tools were available. Pessimist..! Atleast encourage s0methng tht z worth admiring..
Students must learn from this game how to attack with guns in anger at their university. It took me 4 years back when a senior Designed a Map of our University for MOHAA. And another of our Senior & CS student who created a driving simulation game based on the Half Life 2 engine. His simulation based game was Mod of the Month on Half Life 2 forums around the world. That was proper driving test & training game and not just a Map. WoW………. Amazing , I’ve the seen the Iqra University campus….. And I have to tell you this is 100% accurate… Very very well done..
Well done saad! U hav done a great job! This project would be an example for other talented pakistanis and would able them to believe that they can do such great things too! I hope u will do more such stuff in future! I am a Quake 3 lover from India (currently residing in the US). 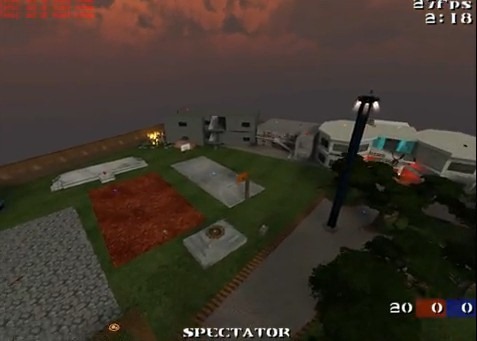 Back when I was in college, it was my dream to make a Quake 3 map of my college. 10 years has passed by and I still play quake every single day of my life but never managed to fulfill my dream. Kudos to you for putting in the hard work and making this a reality!! just love your work. long live Pakistan!